See how we did that? We used the dual meaning of "Entertain" in the title. Not only is Todd hosting the the quartet and crew from Finding Bigfoot in Canada, but from what we hear, the hosts already have a disposition of not taking the man's previous "evidence" seriously. We have THE BEST coverage of Todd Standing. Recently Todd Standing provided a photo for Calgary Sun. Below is the article form the Calgary Sun. If nothing else, the news is bound to make big strides with the Banff tourism industry. No longer will Alberta’s best-known mountain park depend solely on breathtaking scenery and abundant wildlife to impress visitors and lure overseas tourists. And no more envy towards other famous vacation spots like Loch Ness and Lake Okanagan, where legendary creatures are rumoured to lurk. 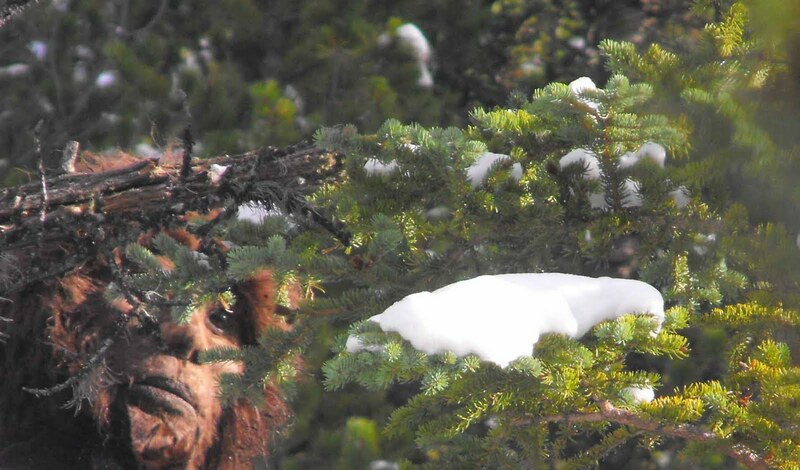 Banff now has Bigfoot. 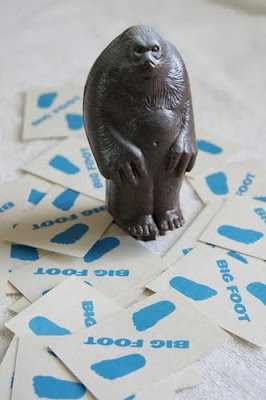 Lots and lots of Bigfoots, in fact. Yes, it’s an allegation that would have Ripley wondering whether to Believe it or Not, and P.T. Barnum reaching for his cheque book, but the mountains west of Calgary are a hotbed for the huge-footed primates. That’s the assertion of a dedicated bigfoot research organization based near Calgary, which claims not only to have video and photo evidence of the mythical beast, but DNA proof as well. “When I first started, I was a skeptic, but not anymore — now I’m a wholehearted believer in the species,” said Todd Standing, spokesman for the Sylvanic Bigfoot group. Standing’s allegations of a Bigfoot colony living near the border of Banff and Kootenay national park will raise many eyebrows, but his evidence has piqued the interest of the Discovery Channel. 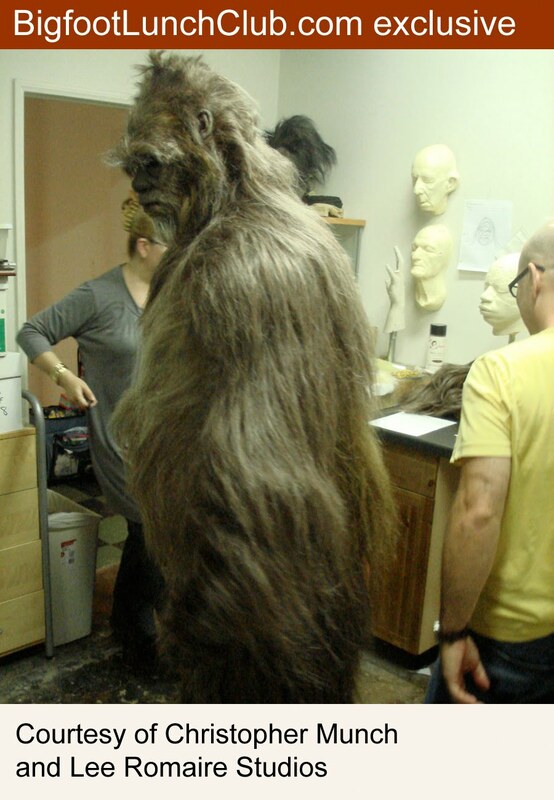 This week, crews from “Finding Bigfoot,” a hit show on Discovery’s Animal Planet channel, are filming in the Calgary area, and Standing says the upcoming episode will be centred upon Sylvanic’s discoveries. “We’ve had exceptional results and we’re working with people doing DNA analysis,” said Standing. He says preliminary results from hair samples sent in for testing suggest an unknown species of primate, while video and photographs suggest a creature larger than a gorilla, with human-like features. Of course, it’s that latter evidence that’s bound to have the skeptics taking sasquatch-sized swipes at Standing, particularly the photographs he says are proof of Bigfoot. Paranormal footage, as a rule, is supposed to be grainy, badly-focused and jittery, as if the camera was assembled by Fisher-Price and mounted to the bumper of a gravel truck. 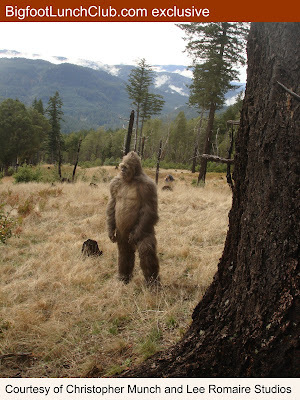 Not Sylvanic: Standing boasts a collection of sharp video clips and crisp photographs of Bigfoot, showing far, far more than the usual hirsute primate dashing behind the nearest bush. Instead of blur, we get full-face portraits of the creature, peering from behind trees. “I’ve had multiple interactions with them, and I’ve filmed them and photographed them on many occasions,” said Standing. What the producers of Finding Bigfoot make of all this remains to be seen, as their quartet of sasquatchologists examines the Alberta evidence to see if it’s on solid footing. Standing says he has — though he knows his belief in Bigfoot and the proof he produces from the Banff backwoods opens him to mockery, derision and the suggestion he should sober up. But he accepts the skeptism, because he originally joined the Sylvanic team with the intent of disproving the ancient story of an ape-like creature hiding in the wilderness of North America. “I thought it was a combination of hoaxes and mistaken identities, and I wanted to prove it wasn’t true,” said Standing. Now, he says Bigfoot is a fact — and with weeks, he hopes to have the DNA evidence to prove it. “We hope to have results by October,” said Standing. If that’s the case, tourism officials in Banff will surely be thrilled. As it is, they welcome the attention of the popular television show, saying any link with Bigfoot is a bonus for visitors. “Anything interesting that attracts people is a good thing — it seems like some harmless fun,” said Mary Morrison, spokeswoman for Banff Lake Louise Tourism. 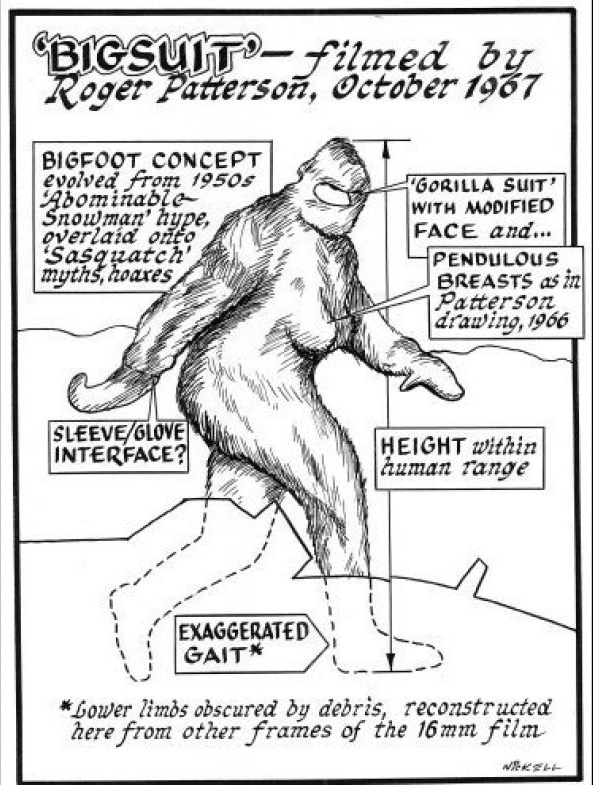 src: Platt: Bigfoot boom in Banff? What do you think of the producers of Finding Bigfoot checking out Todd Standing's evidence? !! This post has been corrected from the original. We had incorrectly assumed Loren Coleman had previously been on Twitter. This is his Debut !! Apologies to Loren. We are pleased to announce that Loren Coleman is on Twitter! 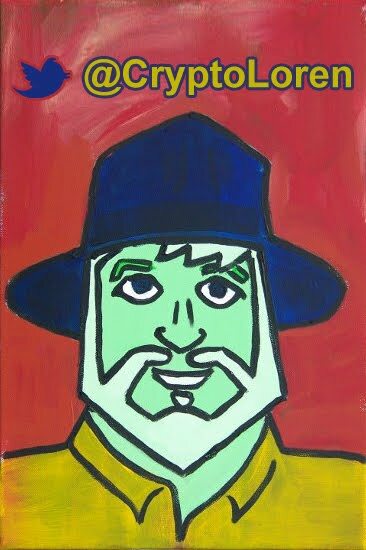 You can follow him @CryptoLoren. 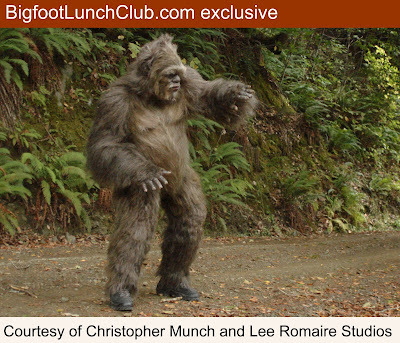 Loren Coleman was the first professional Cryptozoologist to reach out to Bigfoot Lunch Club and welcome us to the world of blogging. Way back in 2008! In the rare case you do not know who Loren Coleman is, you can read Loren's Bio at Cryptomundo. Below is a short excerpt. Starting his fieldwork and investigations in 1960, after traveling and trekking extensively in pursuit of cryptozoological mysteries, Coleman began writing to share his experiences soon after his first expeditions. An honorary member of Ivan T. Sanderson’s Society for the Investigation of the Unexplained in the 1970s, Coleman has been bestowed with similar honorary memberships of the North Idaho College Cryptozoology Club in 1983 (which was inspired by his book Mysterious America), and in subsequent years, that of the British Columbia Scientific Cryptozoology Club, CryptoSafari International, and other global organizations. He was also a Life Member and Benefactor of the International Society of Cryptozoology (now-defunct). We look forward to following Loren Coleman's tweets. As you should too! The pictures below are from a previous post of an alleged Bigfoot. 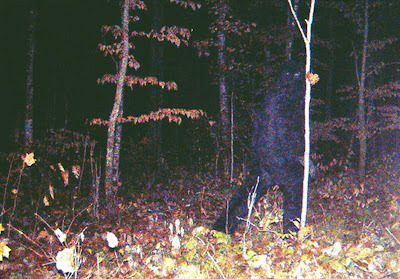 It was taken taken at 7:20 pm, on October 24, 2009, on a rainy night, by a game trail camera in woods north of Remer, Minnesota. This photo was paired with the news article that follows. The enhanced outline version is ours. This is the original, enlarged at a higher density, but otherwise untouched. The red outlines indicate the artificial folds the "stovepiping" of the the hind pant leg. Filming of the second season of Finding Bigfoot is underway. According to an article of Minnesota's local news station WDAZ channel 8, the show’s cast and crew traveled to Carlton County to conduct a town hall style meeting. As you may remember this is the formula of the show. The crew has a local town hall, they pick the best stories and then investigate them. Here is the article in full. CARLTON COUNTY, MN - Add Bigfoot to the list of possible wild animals to call northern Minnesota home. 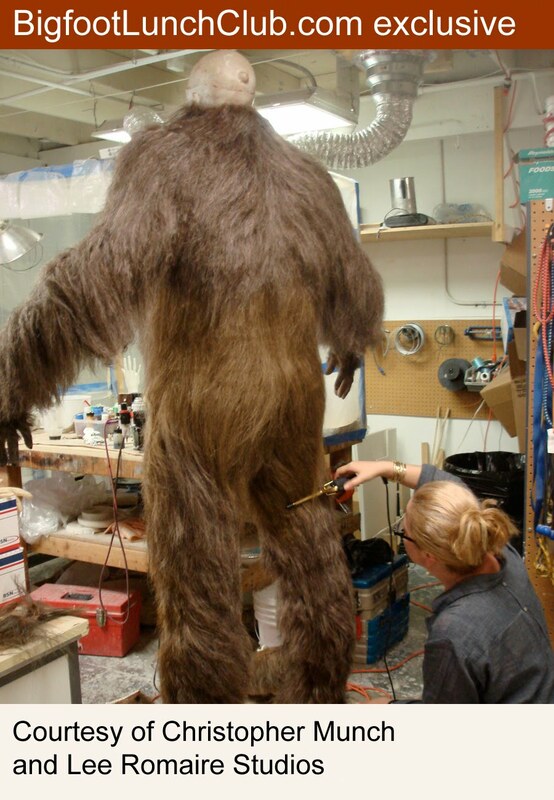 In recent years, there have been multiple claimed sightings of a tall, hairy, long-limbed creature in Carlton County. In recent years, there have been multiple claimed sightings of a tall, hairy, long-limbed creature in Carlton County. 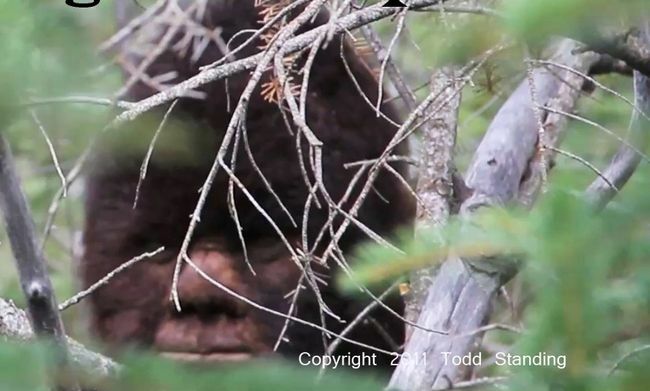 That news piqued the interest of the cable television show “Finding Bigfoot.” The show’s cast and crew traveled to Carlton County this past week to attempt — once again — to prove the creature’s existence. Scores of local residents crowded a town hall-style meeting Monday at the Lakeview Community Center southwest of Wright, Minn., to give their accounts, or hear about them. It was standing-room-only inside the old white wooden building. All 100 seats were full within minutes, with more people standing and sitting along the walls and floors and in the hallway outside the big meeting room. Ages ranged from younger than 5 to older than 80. While not everyone in the room was a Bigfoot believer, most were at least Bigfoot enthusiasts, and/or fans of the “Finding Bigfoot” show. When the program’s host, Cliff Barackman, asked people to raise their hands if they’d actually seen Sasquatch — another name for Bigfoot — about eight hands went up. When he asked if anyone had heard the creature, the number of hands in the air doubled. Then, when Barackman asked if people had heard stories of sightings and other Bigfoot evidence, nearly every person in the room raised a hand. It was, the cast and crew agreed, the largest crowd they’ve seen yet for the program’s signature meeting, held simply so the cast and crew can hear as many stories as people want to tell before they head out into the fields and forests to try to track down the elusive creature. Audience members didn’t need much prodding to start telling their stories. Kristy Aho told how she and her children were sitting on the family’s four-wheeler three years ago in September, waiting for her husband, when they heard a loud crash and then something running so hard they felt the ground shake. Her husband, Dale Aho, got a different view of the creature, Kristy said, estimating its height at 8 or 9 feet. The next time the Aho family had a run-in with Bigfoot was the next July. They were driving past a trail in their pickup truck at dusk when they spotted two big red eyes reflecting the glow of the truck’s running lights. They backed up and looked, and saw a large hairy creature standing maybe 200 feet away. Ranae Holland was the first of the “Finding Bigfoot” cast to question Kristy Aho; she asked if there are also black bears in the area. Jenna Wilenius said she was on the return leg of a four-mile run on County Road 30 about 4 p.m. June 12, 2010, when her dog suddenly began acting strangely. Rather than roaming far and wide as it usually did, the dog started running right at her side, and looking backward in a fearful manner. “I’m thinking that’s the fastest mile you ever ran,” Holland said to Wilenius with a smile. Wilenius’ neighbor, John Gran, stood up and told how he was driving past the Wilenius home the next day when he saw something standing between the garage and the pine trees. Bud Olson has a nice 35 mm camera with a zoom lens, but it wasn’t in his truck the morning he took the newspaper over to his neighbor’s house. Just the day before, he and his son-in-law had heard a weird noise — something they couldn’t identify — when they were gathering sap. When Olson went back later to look for footprints, he didn’t find any on the gravel by the tracks or the grassy embankment. Next time, he said, he hopes to have the camera with him. Moneymaker marveled at the fact that so many claimed to have seen Bigfoot in broad daylight, including Lorraine Tomczak of Automba Township, who said she saw a Bigfoot-like creature peering in the window of an abandoned trailer, then watched it leave and cross the two-lane road with only a few strides. After two boys told how they had seen Bigfoot watching them from outside their home, Moneymaker reassured them and others at the meeting that the creatures have never harmed anyone. While no one at Monday’s meeting provided any solid evidence that Sasquatch does, indeed, live in Minnesota or anywhere else, more than a dozen people stayed after the meeting to give the “Finding Bigfoot” crew details of where they had seen or heard the creature. Others stood around outside, swapping stories or posing for photographs with cast members. Enthusiasts noted that some of the sightings had occurred within a couple miles of the community center where the meeting was held. Margaret Olson Webster figures she lost several pails of sap courtesy of the creature. “I was out collecting maple syrup, and I brought a load into camp when I heard this strange noise,” the lifetime Cromwell resident said. “I’ve heard a lot of animals — this was not an animal. I’ve heard a lot of people do lots with their voices; this was not a person. I just froze. I stood awhile, then I heard the sound again, like something was trying to scare me away. I decided I was going to go collect another load of sap. When I came back, there were six pails of sap dumped on the ground. After hearing the stories and calling a halt to the meeting — which was being filmed by crew members — as the evening light faded, Moneymaker sounded hopeful. This is a documentary 6 years in the making. Produced by Who Forted? 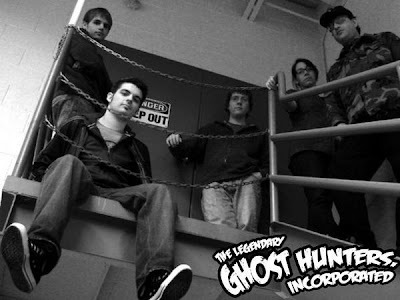 Previously known as Ghost Hunters Incorporated. Who Forted?, created in the fall of 2008, began as a weekly blog about the misadventures of a few jaded paranormal enthusiasts, and before long, it had morphed turned into an online destination for anyone with even a passing interest in all things weird. 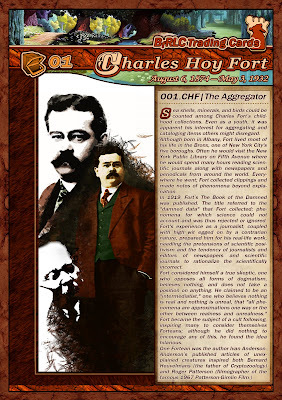 The word "Forted' is a humorous reference to Charles Hoy Fort (August 6, 1874 – May 3, 1932). Fort was an American writer and researcher into anomalous phenomena. Today, the terms Fortean and Forteana are used to characterize various such phenomena. Following the embedded video below is an excerpt from the Who Forted? post announcing the documentary. 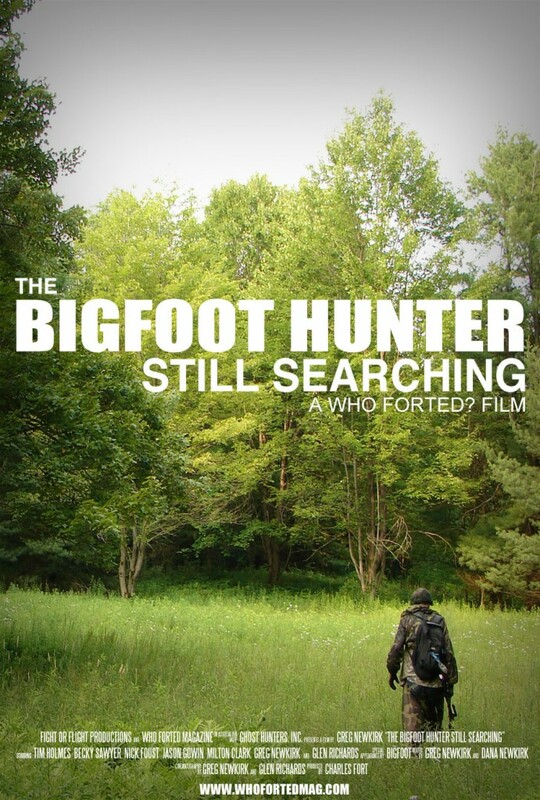 Five years since a small portion of the footage appeared online, we’re more than excited to announce that the feature length documentary film, The Bigfoot Hunter: Still Searching, is nearing completion. The film, shot in the summer of 2006 during two Sasquatch hunting expeditions in the rural hills of down-state New York, follows the often hilarious, sometimes nerve racking, and always fascinating search of two prominent Bigfoot hunters from the New England region. Tim Holmes, ex-merchant marine and founder of the Southern Tier Bigfoot Watch, together with Becky Sawyer, a no-nonsense employee of Searching for Bigfoot Incorporated, take to the forests of the tri-state area in a search for the elusive monster, followed by the cameras of a group of young adventurers, many of whom are now the amateur journalists of Who Forted? Magazine. The Bigfoot Hunter: Still Searching, the first feature length documentary from the people behind Who Forted? Magazine, was directed by Greg Newkirk and is being produced by Toronto’s Fight or Flight Productions in association with Ghost Hunters, Incorporated. What peaked our interest is the fact that they seem to be literally hunting for Bigfoot, with guns and bullets. The other point of interest is the addition of Becky Sawyer, a no-nonsense employee of Searching for Bigfoot Incorporated. Searching for Bigfoot, of course, belongs to Tom Biscardi. Tom Biscardi's involvement, no matter how remote does not bode well for any Bigfoot endeavor. Biscardi is a considered a hoaxer. That's the worst kind of label you can put on a bigfoot researcher. Don't worry, we are not calling Biscardi a hoaxer, we can say with certitude that at the VERY LEAST he has been hoaxed more times than any other researcher, which says he doesn't do his homework. Carmine Thomas Biscardi (born 1948) is a cryptozoology enthusiast, Las Vegas promoter, internet radio host, and film producer. He describes himself as the "Real Bigfoot Hunter". Biscardi has been centrally involved in several hoaxes regarding Bigfoot that have garnered widespread international media attention. The Wikipedia page goes on to identify two hoaxes The Coast to Coast Am (Jul 1985) and The Georgian frozen Bigfoot hoax (Aug 2008). Despite the guns and the proximity to Biscardi's name, we are looking forward to seeing this documentary. Especially since it seems to revolve around the philosophies of the two Bigfoot hunters. Who Forted? is an excellent online zine with great writing and interesting articles. Their college-level humor is refreshing take on all things abnormal. We wish them luck on the distribution and selling of their documentary. and appreciation for Charles Fort. Official announcement of The Bigfoot Hunter: Still Searching from Who Forted? A good friend of Bigfoot Lunch Club, Robert Lindsay, was quick to point out the sleeping Bigfoot from the Erickson Project had similarities to the sleeping Almasty illustration. We can verify that this photo is of a young female Bigfoot sleeping in the forest in Crittenden, Kentucky in 2005. The video was apparently shot by owners of the property in that year, not by the Erickson Project. Therefore, there is a question of whether or not the residents of the house were hoaxing the videos. Apparently they were not, because when the EP moved Dr. Leila Hadj Chikh, PhD in Evolutionary Biology, and Dennis Pfohl into the site after purchasing it, both of them continued to see the Bigfoots on many occasions. 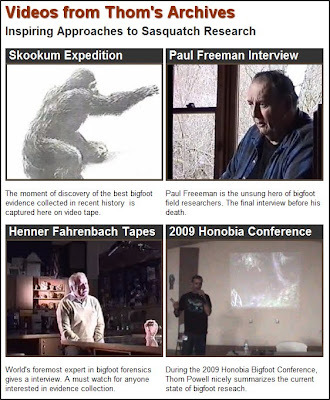 Pfohl also apparently shot quite a bit of video of the Bigfoots at the site. 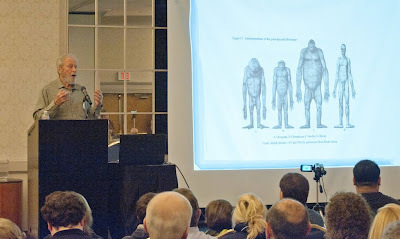 Dr. John Bindernagel, PhD in Wildlife Biology, also saw the Bigfoots there on one occasion. Since the EP saw the Bigfoots at the site also, it is highly dubious that the owners of the site hoaxed the video. It is simply not possible that the Hadj-Chikh, Pfohl and Bindernagel hoaxed their sightings and video. Not possible, no way. They’re not hoaxers. It’s also not possible that Drs. Hadj-Chikh and Bindernagel misidentified a known animal as a Bigfoot. These are PhD biologists here. This is reminiscent of the scene in the USSR where Russian PhD biologists saw Almastys and Yetis on a number of occasions in the 20th Century. "(David Paulides)is a former cop who was forced to retire for beating up a suspect, among other things." "David Paulides and Matt Moneymaker of BFRO hate each other’s guts." "Ketchum’s business not as successful as people think"
"Erickson and Ketchum continuing to feud." Yes these are sensational quotes, taken out of context. Robert Lindsay doesn't care who (or if) he offends. This is quite apparent if you ever read his non-bigfoot related stuff. Although we don't agree with everything Mr. Lindsay says, we think he's quite refreshing. Please visit Robert Lindsay to get the entire details, including the list of the Erickson habituation sites. On his author page at Amazon.com Dr. John Bindernagel's bio is as follows. John Bindernagel, PhD, is a Canadian biologist with over forty years of experience in wildlife research and conservation in North America and internationally. He was educated at the University of Guelph (Ontario, Canada) and at the University of Wisconsin (USA). After beginning his career in Canada in 1963, he worked internationally with the Canadian International Development Agency (CIDA) and the Food and Agriculture Organization (FAO) of the United Nations from 1965 until 1991. During this time he worked and taught in Africa, Asia, the Caribbean, and Central America. There he was involved in wildlife surveys, the preparation and implementation of wildlife management measures, and conservation education. Bindernagel's interest in the sasquatch, which began in 1965, influenced a family decision to relocate from central Canada to British Columbia in 1975. He continues to be involved in wildlife research and resides on Vancouver Island with his wife Joan. John Green one of the original members of Four Horsemen of Sasquatchery says this about Bindernagel's previous book, "John Bindernagel, with a Ph.D. in wildlife biology and extensive field experience in more than one part of the world, has now supplied that need. North America's Great Ape: the Sasquatch could prove to be the most important book yet written on this fascinating subject." Recently the Canadian newspaper, The Globe and Mail, does a great heart-felt piece of Biologist Dr. John Bindernagel. The article does a great job juxtoposing both his previous and most recent books. Wildlife biologist John Bindernagel feels it is only a matter of time before he is proved right, but he is wondering if he will be around for his vindication. “I’m turning 70 this fall...time is running out. That’s certainly what I think about quite a lot,” said Dr. Bindernagel, who is one of the few scientists in the world who openly believes in Sasquatch. He thinks hard scientific evidence, in the form of DNA, could be provided by researchers in the United States later this year, or next. But then again, his hopes have been raised before – only to be dashed when material promised by Sasquatch hunters didn’t materialize or turned out to be phony. Films have been faked. Footprints have been faked. And in one entertaining case, a whole Sasquatch body was faked. 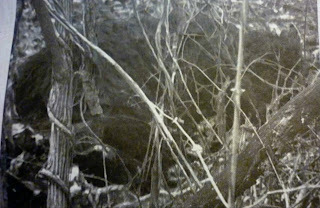 But Dr. Bindernagel says there has also been a lot of strong, compelling evidence for its existence over the years – multiple sightings of an ape-like creature in North American forests, physical signs such as twisted branches, and entirely credible tracks that have been photographed and preserved in casts. That evidence, however, has been so overshadowed by the high-profile hoaxes that Sasquatch have been written off by the scientific community. In 1998, after years of field research, Dr. Bindernagel published a book that treated the Sasquatch, for the sake of argument, not as a mythical creature, but as a species that just needed to be confirmed. He thought his treatise would spark scientific debate. Instead, he found himself shunned. At one wildlife conference, he said, a paper he wanted to present detailing what he thought was important evidence was dismissed as “tabloid material” not worthy of discussion. He wasn’t even allowed to present his argument, let alone defend it. “It isn’t uncommon for a discovery that’s seen as far-fetched, such as this one, to be resisted [by the scientific community],” he said. Dr. Bindernagel said at first he was stung by the way his colleagues rejected his ideas, but he has become more philosophical about it. 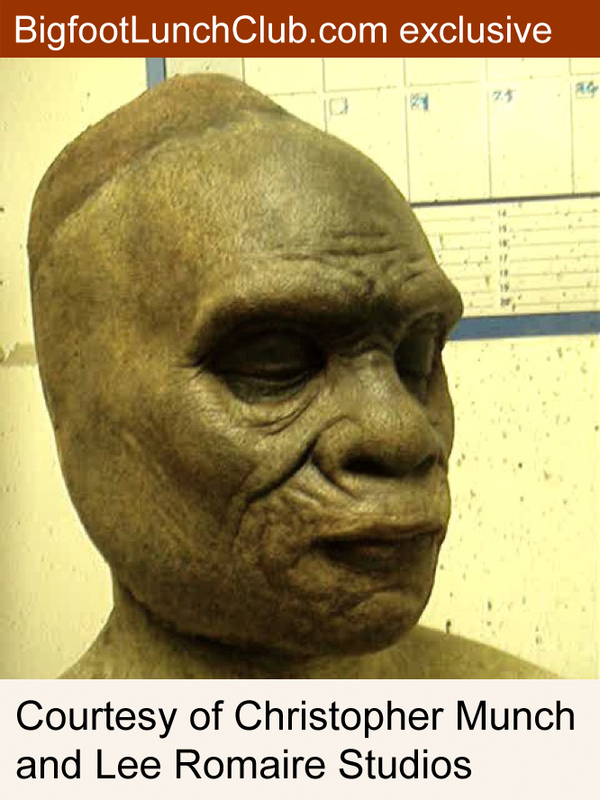 This summer he released a new book, The Discovery of the Sasquatch – Reconciling Culture, History, and Science in the Discovery Process, which deals as much with the scientific community’s attitude as it does with the Sasquatch itself. “In my first book, I described the anatomy and behaviour of Sasquatch. And there was no scientific discussion of that book at all. After about three years, I realized...the problem is I had described the anatomy and behaviour of an animal not yet discovered,” said Dr. Bindernagel. In his new book, he argues that, in fact, the Sasquatch has been discovered, but the discovery has not been acknowledged because the scientific community has a blind spot about the subject. He said the attitude baffles him, and he is hoping his new book will open doors so that he can speak at conferences and present his ideas. His book also chronicles the long history of reported sightings, dating back to the 1800s. 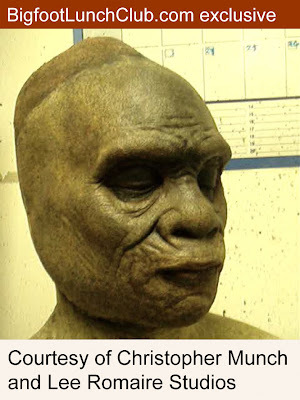 One section deals with the pre-contact record, as seen in native carvings, including a startling mask from the Nass Valley that looks like it was modelled on the face of an ape. Dr. Bindernagel said early anthropologists always recorded native stories about the Sasquatch as tales of a “mythical beast” not as something real. Native story tellers, he argues, were describing something they’d seen – but they couldn’t get themselves taken seriously. Centuries later, he’s pretty much in the same spot. What will it take to change that? “People say you need a [Sasquatch] body...well, obviously. But my question has always been, can we not address this subject prior to that?” he asks. Fans, you all know how well Phillip Morris and Bob Heironimus did re-creating the Patterson/Gimlin film back in 2005. No? Here check it out. One of the biggest fails in the re-creation is the "stovepiping" of the hind leg (this is when the pant-like leg looks like a stovepipe). We didn't even have to use our "pants detecting technology" to see Phill's Costume is a far cry from Patty in the Patterson/Gimlin film. So, who is this Joe Nickell? "...perhaps the world’s only full-time professional paranormal investigator – with a background to match. He has spent his life collecting “personas”: carnival pitchman, stage magician (he was Resident Magician at a Houdini museum), private investigator (for a world-famous detective agency), folklorist and historian, forensic-science author, historical document consultant, and many, many others. In a field where people too often divide into “believers” and “debunkers” – those whose minds are made up in advance of inquiry – Nickell has gained international acclaim and respect as a successful, fair-minded investigator, choosing neither to foster mysteries nor reject them. Taking a hands-on approach, he has traveled around the world to investigate the strangest mysteries – often innovative strategies such as conducting an original experiment, applying a forensic science in a unique way, doing painstaking historical research, or even going undercover and in disguise. Nickell sees science as a progression of solved mysteries. Nickell's i09.com Article has some interesting points, and we recommend reading Loren Coleman's post for balance. Besides i09.com, Nickell has also written an article for Huffington Post. You can read article in it's entirety below. If legends and even many eyewitness accounts are to be believed, since ancient times we have shared our planet with various "man-beasts" - monsters that are more or less in our image. While monsters are often consigned to ancient legend and literary fiction, many are held to be in some sense real. 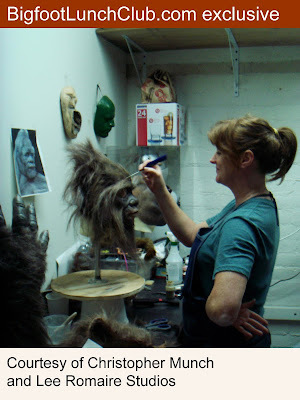 Such paranormal beings (those beyond the normal range of science and human experience) include supernatural ones, such as the werewolf, as well as others (like the Yowie, Australia's version of Bigfoot) that, if they indeed exist, could be perfectly natural creatures. These are those embraced by cryptozoology, the study of unknown or "hidden" creatures (i.e., cryptids). I have been studying these and other reputed paranormalities for 40 years. By 1995 I had become, apparently, the world's only full-time professional paranormal investigator. I have studied mythological, folkloric, and literary monsters; traveled to remote regions in search of legendary creatures; sought vampire graves in Vermont; visited carnival midways to meet human "monsters," look behind the scenes at exhibited spiderwomen and the like, and witness the transformation of a lovely girl into a wild gorilla; took part in a nighttime expedition with Bigfoot hunters; and explored the Pacific Bigfoot country. In the slides that follow, as well as in my new book "Tracking the Man-Beasts," we set out to track the man-beasts - to separate fact from fancy. You can see the slides here. You can read our previous coverage on the Erickson Project. If your new to the subject, the Erickson Project is one of the most anticipated Sasquatch endeavors since it's inception six years ago. On the Erickson Project's website They are self-described as, "...actively researching sasquatch at various study sites in North America. The goal of Adrian Erickson and his team is to have the collected evidence validated by science and the sasquatch officially recognized as a species or sub-species." Click here for Part 1 of Is It Out There? possibly left by a sasquatch in gravel. In a Texas lab, blood, saliva, hair and flesh from what’s believe to sasquatch are being analyzed and sequenced for a genetic blueprint. For now though, what Dr. Melba Ketchum has learned about the animal is a secret. “As an ethical scientist” Dr. Ketchum won’t comment on any of sasquatch DNA testing or her findings until her research has been submitted to a journal and has passed a confidential peer review by experts in the field. Ketchum’s company DNA Diagnostic Inc. specializes in multi-species testing including human as well as animal DNA analysis for individuals, law enforcement, breed associations and state regulatory agencies. It usually runs tests for pet owners pining to find out whether bones discovered in the woods behind their homes belong to beloved Fluffy or Fido who met their demise in the jaws of a coyote. Ketchum stresses the DNA testing is being done independently of the Erickson Project, the first multi-site field study of the sasquatch in Canada and the U.S. with the goal to have it recognized as a species. “The peer review is essential to protect the integrity of a study by independently verifying the scientific analysis and conclusions in order to minimize people claiming this research as another bigfoot hoax or fraud,” said Ketchum. She hopes to have the peer review complete and results ready for release by the end of the year. To prevent people with “some limited knowledge of the ongoing DNA testing from trying to make premature disclosures or claim unfounded credit,” everyone associated with the research is under a legally binding non-disclosure agreement that includes Adrian Erickson, the man who filmed what he believes are sasquatch in Maple Ridge and other research sites in the U.S. But getting a new species recognized isn’t an easy task. Since 2000, there have been many new species “described” but none “discovered” by science. Most of these were species initially thought to be the same, but which are now split into two groups. For example, a sloth thought to be a normal three-toed sloth was found to be a separate species after DNA analysis, explains Arne Mooers, a professor of biology at Simon Fraser University. In terms of real discoveries, the most recent large mammal stumbled upon was the Pseudoryx nghetinhensis or Saola, a bovid (ox) found in Laos and Vietnam in 1992. Another large mammal – Balaenoptera omurai, a whale which range from 8 to 28 metres, was formally described in 2003. Mooers finds it hard to believe a bipedal primate has been in North America’s forests and mountains for centuries. 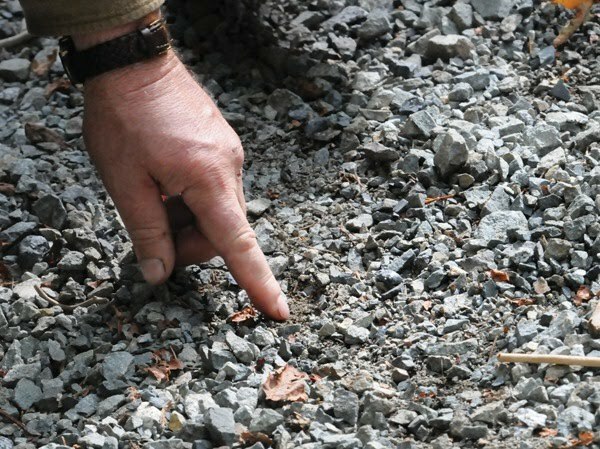 It is too big, he says, pointing out that many of these sasquatch hideouts happen to be rather close to urban areas and suburban subdivisions – but have yet to cough up skulls or bones. North America would also be the last place he’d consider exploring for a new species of primate. “The only primate that lives outside the tropical region is us,” says Mooers. But if someone drove out of the mountains with a dead sasquatch strapped to the hood of their car, it would change his mind. “Never say never,” he says. John Bindernagel is one of the few biologists in the world who readily admits the sasquatch is an extant or “real” animal. Based in Courtney on Vancouver Island, he is more concerned with addressing ecological questions such as how it over-winters in the colder regions of North America and its range. The best proof for Bindernagel are the tracks left behind by sasquatch, especially when those foot prints which have been cast in plaster. Other evidence lies in sightings. “I’ve just heard so many sincere, eyewitness accounts,” says Bindernagel, who has written two books on the subject. 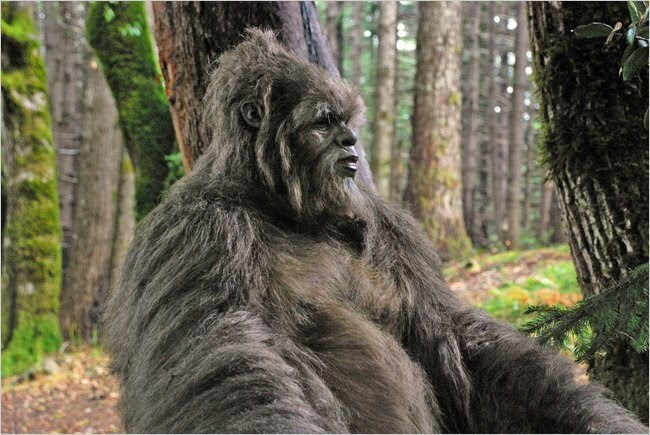 Hoaxes are a big reason why scientists steer clear of sasquatch. Bindernagel believes referring to sasquatch as “Bigfoot” doesn’t help either. “We need to convince them to look at the evidence which is what they’ve been unwilling to do so far,” he said. Tales about sasquatch roaming Golden Ears Provincial Park and thwarting bear-proof bins to snack on garbage amuse Stu Burgess. As park manager, he’s responsible for the “front country” – an area one kilometre from the park’s main road that includes horse trails and campsites. He’s yet to catch sight of any ape-man or – for that matter – odd-looking, seven-foot tall bears with the gait of super models. “I’ve been working up here for 17 years and in that time, I’ve seen two cougars,” he says with a laugh. The Erickson Project intends to release their documentary Sasquatch: The Quest in conjunction with the DNA test results. SRC: Martins, Monisha. "Is the sasquatch out there?Part 2." Maple Bridge News. Ed. Michael Hall. 2011. 18 Aug. 2011 <http://www.bclocalnews.com/tri_city_maple_ridge/mapleridgenews/news/127905518.html>. 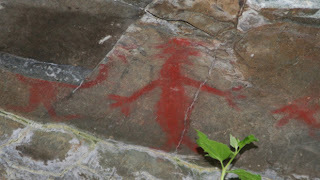 are sasquatch in Golden Ears Provincial Park. From a thicket of hemlock, a rock fell at Jason’s Erickson feet with a thud. It was followed by a second volley, a scattering of tiny pebbles, bound to get his attention. From the trees that crowded at the base of a rocky slope, he heard a purr, a bass, vibrating sound, he was sure didn’t come from a cougar or bear. Stretching from the edge of Maple Ridge to the rugged reaches of Mount Blanshard, Golden Ears Provincial Park is 62,540 hectares of second-growth forest, home to beaver, deer, black bear, and mountain goat. But lurking in the red cedar and moss-covered Douglas fir is where a legend comes to life. Sasquatch – the gigantic hirsute beast that figures in First Nation mythology, the comical Kokanee beer mascot – has been barking at Jason, tossing pebbles at him, banging on trees. Jason’s dad Adrian Erickson is your stereotypical outdoorsman, tall and rugged with weathered skin. He grew up on a small farm in northern Alberta, hunting and trapping with his father at an young age to help supplement their meager income. He saw his first sasquatch at age seven, shrugging off the encounter as something normal, just another beast in the forest, as nothing odd. By the age of 16, while still in high school, Erickson was guiding American moose hunters and after graduation expanded his guiding and outfitting business into reclamation work for the oil and gas industry. At 26, Erickson put down his gun and switched to a bow. He’s comfortable trekking into the wild, spending days camped far from civilization, alone, braving all kinds of weather. In 2001, not far from Jasper, Alta., a sasquatch, quite literally, crossed his path. He admits he initially dismissed it as a cow moose. But he couldn’t avoid the nagging, gnawing notion that the lumbering, hairy brown creature he had seen was no ungulate. He had to find out more. It is a virtual community of scientists, journalists, volunteers and the curious who maintain a database of sightings and research. When Erickson googled “sasquatch” a decade ago, the BFRO was like an easily accessed encyclopedia. “I realized how much evidence there was out there,” says Erickson. He devoured the BFRO’s compilations of eye witness reports from across the continent, the Patterson footage and research done by retired B.C. journalist John Green. Soon, Erickson signed up as a researcher and began to interview people in the U.S. and Canada who claimed to have seen a sasquatch. These were people who were dismissed as kooks, ridiculed, folks who has lost their jobs after revealing they believed in a beast that shared the same plane as fairies and the Loch Ness monster. It made Erickson wonder: why is the sasquatch shunned by science? “If scientists put 10 per cent of the effort into proving this exists, rather than trying to prove it didn’t exist, this would have been recognized decades ago as a species,” says Erickson. 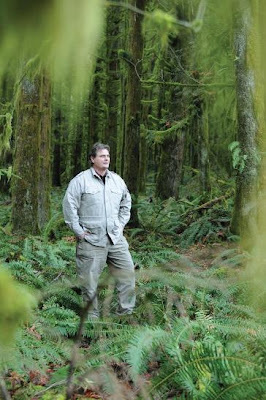 By 2005, Erickson had talked to hundreds of witnesses who were relieved to speak about sasquatches to someone who took them seriously – who had seen them himself. Tired of the wayward stares and sneers, he started the Erickson Project that year, the first multi-site field study of the sasquatch in Canada and the U.S. with the goal to have it recognized as a species. “It is to vindicate the thousands of people who have been ridiculed,” says Erickson, who has been juggling a quest for the sasquatch while he develops acreages in Osoyoos, with his two sons, Jason and Ryan. The term “sasquatch” is an anglicized derivative of the word “Sésquac”, meaning “wild man” in Halkomelem, the language of Coast Salish aboriginals of the Fraser Valley and parts of Vancouver Island. Aboriginal tribes across North America have more than 60 different terms for the sasquatch. And “big foot” isn’t just a North American legend. Yeti and Meh-Teh, the Abominable Snowman, is said to inhabit the Himalayan region of Nepal, India and Tibet. The mapinguari or Inashi is a giant sloth-like creature that features in legends throughout the Amazon, while Yowies are the ape-men of the Australian Outback. 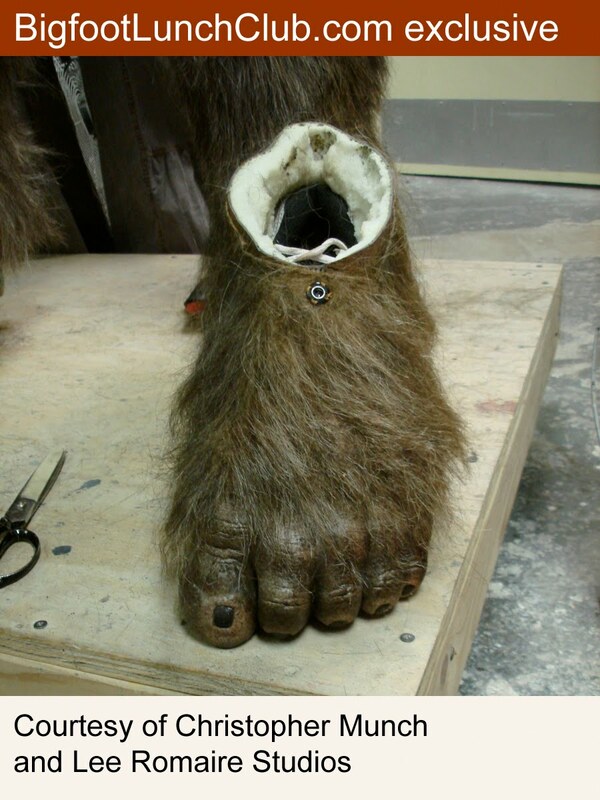 Big foot researchers pledge to study the species in ways that will not harm them. It’s why Erickson won’t tranquilize the creatures. To kill them, he says, would be akin to murder. Erickson says he has seen the sasquatch with his own eyes. So armed with cameras, in 2005, the Erickson Project began its quest to document the sasquatch, capturing what is purported to be the only other footage of the creature since the 1967 Patterson-Gimlin film. 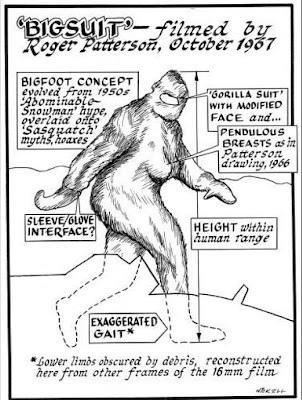 Most scientists believe the Patterson film is a hoax with a man in an ape suit, but some people, including Erickson, insist it’s a creature unknown to science. The creature in the Patterson film resembles the sasquatch he’s seen, says Erickson. They have well-defined muscular physiques, long arms and walk like runway models. Erickson and his Reel Productions team say they filmed the sasquatch in Maple Ridge and in U.S. locations. They didn’t just film one – but several. They caught them sleeping, peering through trees and via thermal images. In his film, you can hear the sasquatch make low guttural sounds, the kind that make your hair stand on edge. The creatures are in a variety of colours – grey, brown and an orangutan orange. The location in Golden Ears Provincial Park was ideal because it had been hiked for more than a decade by the man who reported the sightings to Erickson. The sasquatch were not afraid to interact with the man, growing more familiar with him as he returned to the area. Erickson filmed at the location for two years and collected hair samples from what he says is a grey, light-coloured sasquatch. “You whistle and they whistle back. They won’t interact with strangers,” he explains. Not all encounters are visual. The sasquatch like to chuck rocks at you. They are skittish. “We don’t know why they pick certain people to show themselves to,” says Erickson. Although Erickson captured sasquatch several times in clear, crisp images, he soon realized people would still dismiss his video as a hoax. “The more evidence we got, scientists started backing away further and we got really tired,” he says. He hired Dr. Leila Hadj-Chikh, a biologist, who has a PhD in ecology and evolutionary biology, from Princeton University, along with Dennis Pfohl who set out to collect blood, saliva, hair and skin samples. A resident of Colorado, Pfohl, is an avid outdoorsman who had some strange encounters while camping in the backcountry. Married with four children, he has spent the past six years hunting sasquatch with a camera and baiting them with food for samples of their DNA. The Erickson Project picked sites in Maple Ridge, Texas, Kentucky, Tennessee and Alabama where they knew they could get close to the creatures. Pfohl says the reports from those locations were credible and the sasquatch were known to return to the areas, especially to snack on human food. Much like bears, it seems the sasquatch have a taste for garbage and sweet things. Pfohl spent six months of the year visiting the research sites, trying to perfect his techniques. He’s missed birthdays, many Christmases, his son’s graduation. “Cumulatively it takes thousands of hours to collect the DNA,” he says. Pfohl’s baited the sasquatch with dog food but finds cakes and candy – Twinkies, Ding Dongs, Susie Qs – are what they like best. He’d leave them at the site for two or three days and is confident it was sasquatch that took the snacks rather than a raccoon or bear. He also figured pancakes were an inexpensive and quick-to-create bait. When he didn’t have time to cook pancakes, he’d drive to a local McDonalds and buy a stack. Sasquatch like them smothered in syrup. “I often think I’m leading to their early death by cardio vascular disease. Or the poor things will end up with tooth decay because of all the sweets,” he says with a laugh. Pfohl sees himself as someone on a mission to find answers. “A lot of scientists won’t risk their reputations or careers on this,” he says. “The discovery of a species – a bipedal hominid – that is the greatest discovery of modern day man. “How could they live all these years and we didn’t know they were there? SRC: Martins, Monisha. "Is the sasquatch out there? Part 1." Maple Bridge News. Ed. Michael Hall. 2011. 18 Aug. 2011 <http://www.bclocalnews.com/tri_city_maple_ridge/mapleridgenews/news/127560548.html>. you may have read our ongoing coverage of the Christopher Munch directed movie Letters from the Big Man. Recently we connected with the creature and character effects artist of the Sasquatch from the movie (see photo above). The artist is Lee Romaire, and his creature shop is aptly named Romaire Studios. Lee was nice enough to answer a few questions, but before we get to the interview lets check out Lee's work in action. BLC: Lee thanks for letting us have this interview, we are big fans of your craft and have a lot of respect for the art you create. How were you approached to do letters from the Big Man? Had you had a prior relationship to Christopher Munch? Lee: First let me say "thank you" for giving me the opportunity to speak about this project. I really enjoy your website. LEE: I was recommended to Chris by my friend Kazuhiro Tsuji. Kazu is literally, in my opinion, the best make-up artist in the world, so it was a real honor that he referred me to Chris. At that point, Chris was exploring his options on how to do the sasquatch. I could tell by our initial conversations that he wanted it to be live in a natural, realistic world, and to be 100% believable, which is what really excited me about the project. Sasquatch has always been either been a monster or a clown, but has rarely been portrayed in a natural manner. The opportunity to work with someone like Chris to explore the subject was just too good to pass up. 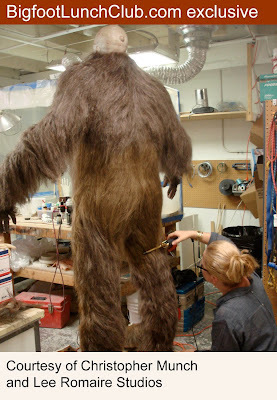 BLC: I'm sure when some one requests a Sasquatch you already had some ideas, by the end of the final design, what differed from you initial concept? LEE: If you are a creature/character designer, you have a least 4 or 5 ideas in your head about what a sasquath would look like right off the bat. But I based my design from the beginning on the actor Issaac Singleton. I wanted his essence to come through in the make-up and suit. He has a very imposing presence because he is a big guy with a deep voice. But once you get to know him he has a very gentle side, which is why I think Chris chose him. I wanted all of that to show through the facade, and I think it did, so to answer your question I don't think it turned out too far from my original concept. BLC: How was the process with Chris? Did he have definite ideas and boundaries, what were you able to add? LEE: Chris was a really great director to work with. I worked with Brian Henson several years ago on a Steven King tv project, and Chris reminded me of working with Brian in that they are both very very experienced and they were both really patient and appreciative of my input. Making these kind of suits is difficult and frustrating at times, so when you have someone in the lead who is very confident in your ability and allows you do your work, it makes the process much easier. Chris had some great illustrations that he wanted to base the sasquatch off of, so we used some elements from those drawings. 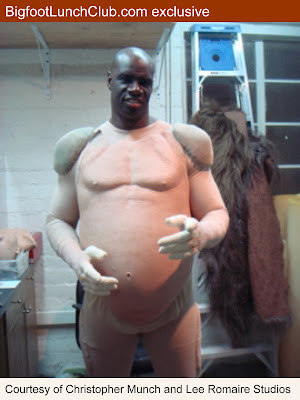 Because BIG MAN is an independent film, we didn't have a million dollars to make a sasquatch, so I had to think very practically about what was achieveable. For example, we couldn't build arm extentions or any sort of mechanical face. Everything had to last throughout the shoot because we couldn't afford to do spares, so we used latex rubber finger tips instead of foam latex, which would have torn on the first day of filming. Little things like that helped make it all happen. 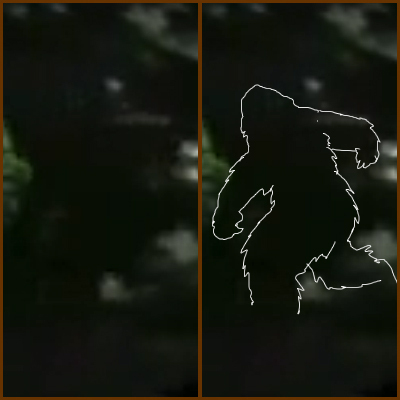 Chris actually asked me in to look at the sasquatch shots he and the editor chose and I was able to point out which ones I thought didn't work from a realistic viewpoint. It i is very rare to have that opportunity like that, where a director and editor want your input on the post look creaure effects. This was also the first film that my studio had a chance to do digital make-up enhancement. After Chris allowed me to look at the footage, I felt that we could go just a bit further in taking the human element out but keeping Issaac in. So I suggested that we do some digital enhancement. I've done digital enhancement before, but only for my own work. I assembled a team, and we picked the shots that I thought needed enhancing- basically all of the close ups. We enlarged the irises, slanted the eyes ever so slightly and moved the lower lip just a bit. On the big screen it is imperceptible, but very effective. So I consider it a new tool in my arsenal. 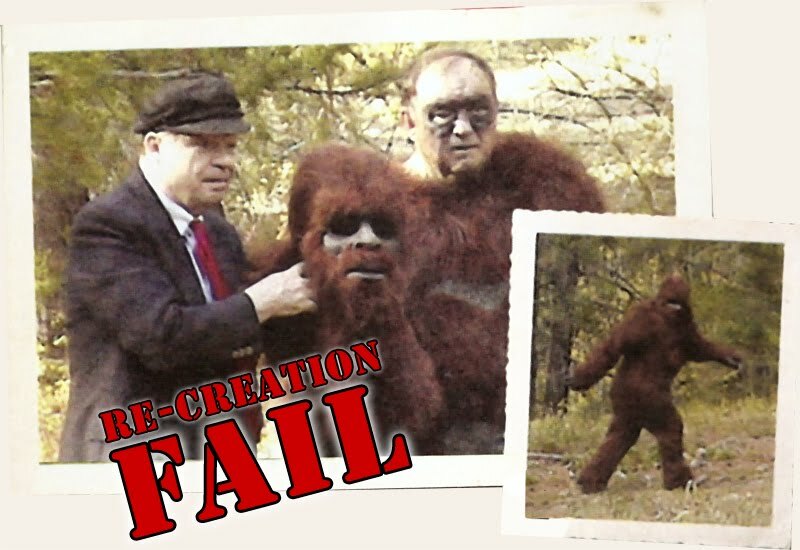 BLC: What were some of the inspirations you used to create the final design, for instance did you look at specific primates, Rick Baker stuff, and the Patterson/Gimlin footage? LEE: My main inspiration was the actor, Issaac Singleton jr. I wanted his face to come through the make-up. I did use a lot of primate reference. At one point we were talking about a more human feel, but I felt it had to have a wild animal/alien feel. The human would come through isaac's eyes. I really tried to stay away from Rick Baker's work and from Patterson/Gimlin footage. The last thing we wanted was for him to look like Harry from Harry and the Hendersons. Harry is a great iconic character, but it seems there are so many bad copies of harry are out there, and it would be insane to try to mimic a suit that cost millions of dolllars with a fraction of that available to us. So I pieced together a new primate looking creature. BLC: As a make-up artist do you have an opinion on the creature in the patterson/Gimlin footage? LEE: The only thing I want to say about that footage is that I desperately want it to be real, so that clouds my judgment. BLC: On your site you have a few jobs that are defined as being done in "record time", was this the case with Bigman? How long did each stage take on bigman, Design vs. production. LEE: I always want to have more time on jobs. I would have loved to have more time and more money on BIG MAN of course, but you have to deal with the reality of your situation. We had several months, a very open an cooperative director and Isaac was very helpful in coming in for fitttings. Our design process went quickly, it was the production of the suit that took up a lot of the time. Chris fortunately pushed the schedule, so the crew had enough time to get what I think is a pretty good result. BLC: Some of the things I liked about the design was the placement of the ears, the belly, and the facial hair pattern. Any stories behind any of those decisions? with hair so there is an illusion that the mouth is wider than Isaacs mouth really is. BLC: Was there anything you were trying specifically not to do? LEE: Yes, I was trying to stay away from the "monster" look and the "harry and the henderson's look. There are many things that I would have liked to do, like lengthen the arms, change the shoulder set a bit, make his legs shorter looking etc. but it just wasn't practical for this project. Perhaps on LETTERS FROM THE BIG MAN 2 we will be able to do more. BLC: Please tell us about your studio, how you got started, past and future projects, what are your influences? LEE: My studio creates creatures and characters for entertainment purposes, which in include movies, tv shows, and museum and theme park attractions. I am lucky work with a lot of talented artists who help create the things we produce. On BIG MAN, we had a crew of about 7 people who helped make everything. We do a wide range of projects. I've been doing work with Disney Imagineering recently, and one of my most interesting projects was to be part of the team at Disney Imagineering research and develeopment who re-created Abraham Lincoln for the Disneyland attraction THE WALT DISNEY STORY FEATURING GREAT MOMENTS WITH MR. LINCOLN. Abraham Lincoln was the very first human Audio Animatronics © figure that Walt Disney attempted, so it was very exciting to become part of that lineage. Most people in my business loved monster and horror movies as children, and take their inspiration from that. I enjoyed that as well, but I was very interested in fake things that looked real as a kid, and being from the south, I took up taxidermy as a hobby. Being from Louisiana, it was a natural choice for me as a youngster. I practiced taxidermy from age 6 into my early 20's and had people paying me for my work at about age 10. I'm not saying it was good work, but it helped me refine my eye for what looks real. I went to college and majored in advertising and marketing, but there was something missing for me. So 10 years into my advertising career I decided to make a change and work on make-up effects in Hollywood. And I've done a lot of creatures and characters since then. I am currently making my first short film entitled LET'S EAT LOLLY, that includes a lot of creatures and effects that my studio created. I will see it completed by the end of this year. BLC: Thanks for the opportunity to do this interview. We have to ask one last question. What is your take on Sasquatch in general? LEE: I think it's great. It allows us to dream and have adventure and mystery in our lives.It allows us to maintain some of the wonder and innocence of childhood. Although it would be thrilling for the world to actually gain proof positive scientific evidence of the sasquatch's existence, there is something wonderful about us never knowing the truth. In my experience in life, the truth about a thing is never as interesting as the stories we weave around it. BLC: Thanks again Lee, we hope to you keep us updated on your new first short, "LET'S EAT LOLLY" and good luck with Mr. Lincoln. We look forward to watching for updates on your website www.leeromairestudios.com. Taking a stroll in the neighborhood I noticed a Board Game Store here in Portland. The place was called Off The Charts Games and it didn't take long for me realize board games have evolved beyond Monopoly and Scrabble. There were advanced strategy board games, commonly referred to as European Board Games, based on building worlds, villages, train routes, and even pizzas. The owners Ron and Lynn were quick to explain every game they had in stock. I had only only question, "Do you have a game based on Bigfoot?" (It's amazing how everything seems to be related to bigfoot). They were quick to point out an out-of-print game that was originally printed in Germany called Yeti. The american version was published under the title Big Foot, yes there is a space between big and foot. 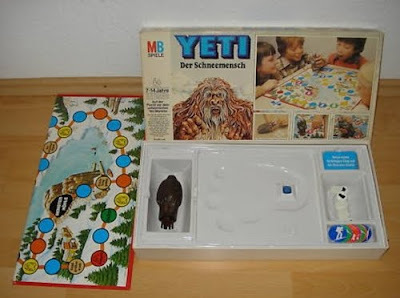 I was a little disappointed that after this huge boom in European Board Games, no one had decided to do another Bigfoot game. Ah but there was! 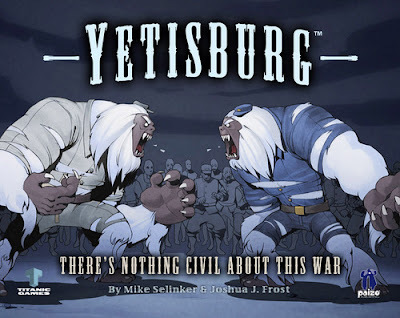 Enter, Yetisburg. Somehow they forgot to tell you in History class that during the Civil War each army had their own uniformed Yeti army recruited from Canada. Many of these strategy board games are based on role-playing real events. We would love to see one based on doing Sasquatch Field research that also works as a training kit for all who endeavor the search for the Squatch. Thanks to Ron and Lynn of Off The Charts Games for the informative visit. If you are in the Portland area and want to find board games or even European board games give Ron and Lynn a visit. The above picture is from a frame of a new video that has been making some ripples on the internet. The white outline is ours to demonstrate a few things. One, this is probably the best frame from the video and without the context of the rest of the action, it would have been hard to distinguish the actual Sasquatch. 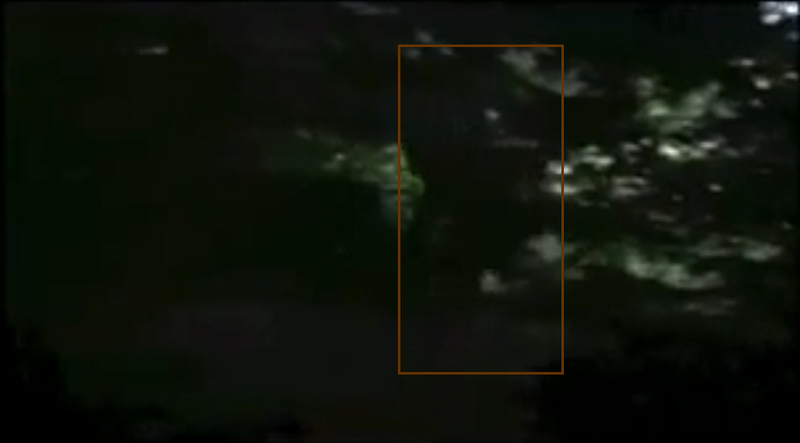 Two, this is the best frame of the video and it gets us no closer to confirming it is a real Sasquatch. All this is true, but we are firm believers that it is not just the destination it is the journey. Half the fun is getting there. And if we had a third aphorism that made us feel better for not discovering bigfoot yet, we would include it here also. So let's enjoy the journey, long-time fans know we don't post on every you-tube video that pops up. If you want video analysis, no one does it better that FBFB (Facebook Find Bigfoot) No one does it better. No one. It comes as no surprise that when a local weekly paper in Minnesota, City Pages does a report on a the Stiollwater bigfoot the video analysys they us is FBFB's. ​Now that the Department of Natural Resources claims to have solved Minnesota's chupacabra mystery, they're going to have to tell us what the hell this thing is. A Minnesota farmer and his wife were walking in the woods north of Stillwater one July night, when they saw a strange animal, according to a new YouTube video. The couple thought they'd come upon a deer, but heard a "low odd sounding grunt," and decided to get closer and see what it was. "Doesn't look like a deer to me," the farmer explains in the set-up to the video. In the video clip the man captured that night -- now the subject of a thorough investigation by a Youtube curator called "SasquatchWatcher" -- a large, red-haired figure is seen passing through the woods for a single fleeting moment. The tape, as discovered by Karl Bremer at Ripple in Stillwater, is described as taken "near the St. Croix river." Great. Maybe this Bigfoot can be used to fish out some of those flying Asian carp. According to SasquatchWatcher's expert analysis, the object seen strolling through the woods is, of course, an Auburn Sasquatch. In the video, he analyzes the footage and compares it to other existing footage of Bigfoot (Bigfeet?). The movement, the coloring, the size, the musculature... there can only be one answer: Bigfoot, the auburn Sasquatch. "The filmer," the video explains, "answered a few questions, realized this was serious, and wisely chose not to pursue it." The site is a great supplement to his book. Included on the site is an interactive map, called Shady Places. The map highlights locations that inspired the book. If you read the book and reference the map you can find the squatchiest locations in Clackamas County, Oregon. According to Bigfoot Field Researchers Organization, Clackamas County has the highest rate of reported sightings. 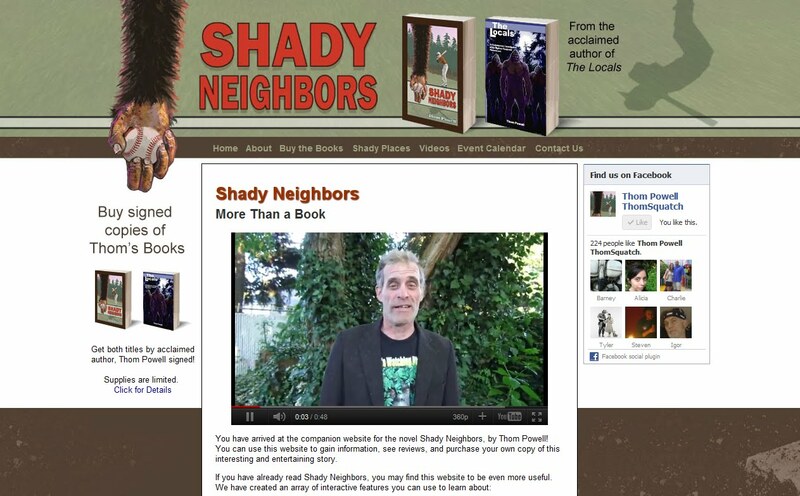 Best of all you can get signed copies of The Locals and Shady Neighbors from the man himself. The Locals is out of print and Thom only has a few left himself. Buy Thoms books here. Finally, Thom has some great videos of the moments when they first discovered the body print of the Skookum Cast, as well as the footage of the casting. Thom plans on continuing to expand his website, share his creative writing process, and intrigue us with his take on the Sasquatch phenomenon. We will keep you posted as updates occur. Ethos is a nationally recognized, award-winning student publication. They do a great job covering the Sasquatch topic while visiting Thom Powell. Below is a little teaser with a link to the full article on Thom Powell's new site Shady-Neighbors.com (we will cover the new site tomorrow). Suddenly, Wilson shatters the eerie silence with an agitated spurt of barks. Powell’s flashlight flicks on. Its beam pierces the darkness, scanning the scattered pine trees for a glimpse of what alarmed the dog. A pair of eyeballs hovers in the blackness like a pair of glowing orbs. Powell edges forward to get a closer look. As his flashlight’s radius increases, the fiendish night beast is revealed to be a mere cow. For Powell, this is not an ordinary stroll through the woods. These are lands he has traversed hundreds of times with a specific purpose in mind. He is on the prowl for a creature more formidable than a pack of coyotes and more elusive than a wolf: Powell is searching for Sasquatch.